CLEAN UP presents works by Victor Jeffreys II, Day Minh Le, Nic Rad & Adam Wissing, Moza Saracho, Amanda Sromek, Ultra Violet, Marela Zacarias; curated by Anne Huntington. 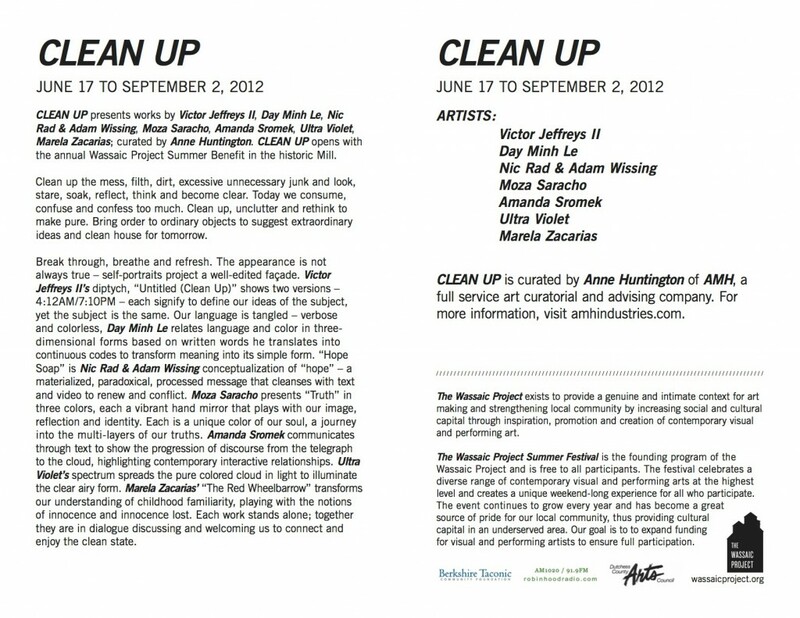 CLEAN UP opens with the annual Wassaic Project Summer Benefit in the historic Mill. Clean up the mess, filth, dirt, excessive unnecessary junk and look, stare, soak, reflect, think and become clear. Today we consume, confuse and confess too much. Clean up, unclutter and rethink to make pure. Bring order to ordinary objects to suggest extraordinary ideas and clean house for tomorrow. Break through, breathe and refresh. The appearance is not always true – self-portraits project a well-edited façade. Victor Jeffreys II’s diptych, “Untitled (Clean Up)” shows two versions – 4:12AM/7:10PM – each signify to define our ideas of the subject, yet the subject is the same. Our language is tangled – verbose and colorless, Day Minh Le relates language and color in three- dimensional forms based on written words he translates into continuous codes to transform meaning into its simple form. Hope Soap” is Nic Rad & Adam Wissing conceptualization of “hope” – a materialized, paradoxical, processed message that cleanses with text and video to renew and conflict. Moza Saracho presents “Truth” in three colors, each a vibrant hand mirror that plays with our image, reflection and identity. Each is a unique color of our soul, a journey into the multi-layers of our truths. Amanda Sromek communicates through text to show the progression of discourse from the telegraph to the cloud, highlighting contemporary interactive relationships. Ultra Violet’s spectrum spreads the pure colored cloud in light to illuminate the clear airy form. Marela Zacarias’ “The Red Wheelbarrow” transforms our understanding of childhood familiarity, playing with the notions of innocence and innocence lost. Each work stands alone; together they are in dialogue discussing and welcoming us to connect and enjoy the clean state.